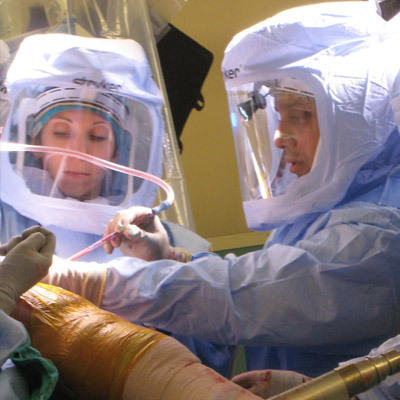 The ideal applicant has an interest in complex adult hip and knee reconstruction, is highly motivated and driven to continue the cutting edge research our attendings perform. To apply for a clinical fellowship position, please submit your application through the San Francisco Match (www.sfmatch.org). Foreign medical graduates will be considered provided they have passed either the Foreign Medical Graduate Exam or the FLEX Exam, can obtain a full Virginia medical license and secure their own VISA to work in the US. To be eligible for a “full” Virginia license, candidates MUST have two years of post-graduate clinical training in the US/Canada from an ACGME accredited facility. Our institution is not ACGME accredited or affiliated with a major medical school and are unable to help obtain the appropriate VISA for this clinical training, according to the requirements through ECFMG (Educational Commission for Foreign Medical Graduates).